What’s happened in Hebes Chasma on Mars? Hebes Chasma is a depression just north of the enormous Valles Marineris canyon. Since the depression is unconnected to other surface features, it is unclear where the internal material went. Inside Hebes Chasma is Hebes Mensa, a 5 kilometer high mesa that appears to have undergone an unusual partial collapse — a collapse that might be providing clues. The above image, taken by the robotic Mars Express spacecraft currently orbiting Mars, shows great details of the chasm and the unusual horseshoe shaped indentation in the central mesa. Material from the mesa appears to have flowed onto the floor of the chasm, while a possible dark layer appears to have pooled like ink on a downslope landing. A recent hypothesis holds that salty rock composes some lower layers in Hebes Chasma, with the salt dissolving in melted ice flows that drained through holes into an underground aquifer. This entry was posted in 2014, Astronomy Picture of the Day and tagged Mars on August 12, 2014 by mari. June 24th marked the first full Martian year of the Curiosity Rover’s exploration of the surface of the Red Planet. That’s 687 Earth days or 669 sols since its landing on August 5, 2012. To celebrate, consider this self-portrait of the car-sized robot posing next to a rocky outcrop dubbed Windjana, its recent drilling and sampling site. The mosaicked selfie was constructed with frames taken this April and May using the rover’s Mars Hand Lens Imager (MAHLI), intended for close-up work and mounted at the end of the rover’s robotic arm. The MAHLI frames used exclude sections that show the arm itself and so MAHLI and the robotic arm are not seen. Famous for panoramic views, the rover’s Mastcam is visible though, on top of the tall mast staring toward the left and down at the drill hole. This entry was posted in 2014, Astronomy Picture of the Day and tagged Curiosity, Mars on June 27, 2014 by mari. Staring up into the martian sky, the Opportunity rover captured an image at 11:02 AM local mean time nearly every 3rd sol, or martian day, for 1 martian year. Of course, the result is this martian analemma, a curve tracing the Sun’s motion through the sky in the course of a year (668 sols) on the Red Planet. 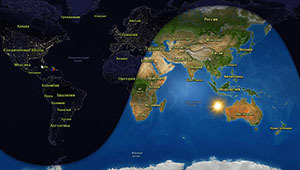 Spanning Earth dates from July, 16, 2006 to June 2, 2008 the images are shown composited in this zenith-centered, fisheye projection. North is at the top surrounded by a panoramic sky and landscape made in late 2007 from inside Victoria crater. The tinted martian sky is blacked out around the analemma images to clearly show the Sun’s positions. Unlike Earth’s figure-8-shaped analemma, Mars’ analemma is pear-shaped, because of its similar axial tilt but more elliptical orbit. When Mars is farther from the Sun, the Sun progresses slowly in the martian sky creating the pointy top of the curve. When close to the Sun and moving quickly, the apparent solar motion is stretched into the rounded bottom. For several sols some of the frames are missing due to rover operations and dust storms. This entry was posted in 2014, Astronomy Picture of the Day and tagged Analemma, Mars, Opportunity on May 16, 2014 by mari. The largest canyon in the Solar System cuts a wide swath across the face of Mars. Named Valles Marineris, the grand valley extends over 3,000 kilometers long, spans as much as 600 kilometers across, and delves as much as 8 kilometers deep. By comparison, the Earth’s Grand Canyon in Arizona, USA is 800 kilometers long, 30 kilometers across, and 1.8 kilometers deep. The origin of the Valles Marineris remains unknown, although a leading hypothesis holds that it started as a crack billions of years ago as the planet cooled. Several geologic processes have been identified in the canyon. The above mosaic was created from over 100 images of Mars taken by Viking Orbiters in the 1970s. This entry was posted in 2014, Astronomy Picture of the Day and tagged Mars on May 11, 2014 by mari. What has the Curiosity rover come across on Mars? Dubbed Mount Remarkable, the rolling robot has chanced upon this notable 5-meter tall mound during its continuing journey around and, eventually, up 5.5-kilometer high Mt. Sharp. Unsure of the density of the surrounding layered sandstone, the human team on Earth has instructed the car-sized rover on Mars to drill into a rock on the side of Mt. Remarkable to investigate. Quite possibly, water involved in creating the dense sandstone could have helped to support ancient life on the red planet. Mt. Sharp, the unusual central peak of Gale Crater, has a similar base-to-peak height as Earth’s Mt. Everest. This entry was posted in 2014, Astronomy Picture of the Day and tagged Curiosity, Mars on May 7, 2014 by mari. Recorded on April 15th, this total lunar eclipse sequence looks south down icy Waterton Lake from the Waterton Lakes National Park in Alberta, Canada, planet Earth. The most distant horizon includes peaks in Glacier National Park, USA. An exposure every 10 minutes captured the Moon’s position and eclipse phase, as it arced, left to right, above the rugged skyline and Waterton town lights. In fact, the sequence effectively measures the roughly 80 minute duration of the total phase of the eclipse. 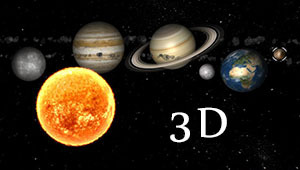 Around 270 BC, the Greek astronomer Aristarchus also measured the duration of lunar eclipses – though probably without the benefit ofdigital clocks and cameras. Still, using geometry, he devised a simple and impressively accurate way to calculate the Moon’s distance, in terms of the radius of planet Earth, from the eclipse duration. 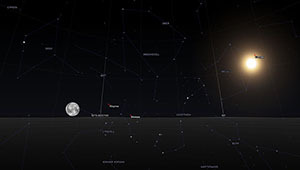 This modern eclipse sequence also tracks the successive positions of Mars, above and right of the Moon, bright star Spica next to the reddened lunar disk, and Saturn to the left and below. This entry was posted in 2014, Astronomy Picture of the Day and tagged Full Moon, lunar eclipse, Mars, Spica on April 17, 2014 by mari. A beautiful, reddened Moon slid through dark skies on April 15, completely immersed in Earth’s shadow for well over an hour. It was the year’s first total lunar eclipse and was widely enjoyed over the planet’s Western Hemisphere. Seen from the Caribbean island of Barbados, the dimmed lunar disk is captured during totality in this colorful skyview. The dark Moon’s red color contrasts nicely with bright bluish star Spica, alpha star of the constellation Virgo, posing only about two degrees away. Brighter than Spica and about 10 degrees from the Moon on the right, Mars is near opposition and closest approach to Earth. The Red Planet’s own ruddy hue seems to echo the color of the eclipsed Moon. This entry was posted in 2014, Astronomy Picture of the Day and tagged Full Moon, lunar eclipse, Mars, Spica on April 16, 2014 by mari. Aloha and welcome to a breathtaking skyscape. The dreamlike panoramic view from March 27 looks out over the 10,000 foot summit of Haleakala on Maui, Hawai’i. A cloud layer seeps over the volcanic caldera’s edge with the Milky Way and starry night sky above. Head of the Northern Cross asterism, supergiant star Deneb lurks within the Milky Way’s dust clouds and nebulae at the left. From there you can follow the arc of the Milky Way all the way to the stars of the more compact Southern Cross, just above the horizon at the far right. A yellowish Mars is right of center, near the top of the frame, with rival red giant Antares below it, closer to the Milky Way’s central bulge. Need some help identifying the stars? Just slide your cursor over the picture, or download this labeled panorama. This entry was posted in 2014, Astronomy Picture of the Day and tagged Antares, Mars, Milky Way, Northern Cross on April 12, 2014 by mari. Tonight Mars is between opposition (April 8) and closest approach (April 14) looping through the constellation Virgo opposite the Sun in the night sky. That makes it prime season for telescopic views of the the Red Planet, like this one from April 3rd. The clear, sharp image was captured with a high-speed digital camera and 16-inch diameter telescope from Assis, Brazil, Planet Earth. Mars’ north polar cap is at the top left. Also visible are whitish orographic clouds – water vapor clouds condensing in the cold atmosphere above the peaks of Mars’ towering volcanos. The exact dates of closest approach and opposition are slightly different because of the planet’s elliptical orbit. Still, get your telescope out on the night of closest approach (April 14/15) and you can view both Mars and a total eclipse of the Moon. Mars will be about 1/100th the angular size of the Moon. This entry was posted in 2014, Astronomy Picture of the Day and tagged Mars on April 11, 2014 by mari.